Tomorrow the Giving Thanks Blog Hop, hosted by Michele over at Quilting Gallery will begin and I’m excited! I will be participating and so are many more bloggers all around the world, after all, there’s much to be thankful for, wherever you are!!! The list of bloggers participating in the Blog Hop Party will be made available Thursday late afternoon on November 21st, 2013 (Eastern time). 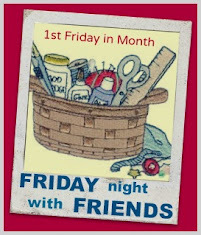 Come back tomorrow and click on the banner on the top of my sidebar then to start hopping and entering the give-aways from your fellow quilters. I can’t give too much more away, suffice to say I am giving away a………………….shhhhhhh……oops, can’t tell till tomorrow~!!!!! So make sure you come back then to find out some more!!!! In the meantime, I’ve been working on finishing my stable bag that I began on the weekend and I’m glad to say, it’s done! I had fun playing around with the decorative stitches on my machine to quilt the panels…..
practiced some piping, and even learnt how to cover cord for the handles…. There’s plenty of room in there with two big pockets, and the dowelling that’s hidden inside the white ‘loops’ really gives the bag some structure. See what I mean by I’m lovin’ it!?!??? I was surprised at how quickly this came together…..and no, unfortunately I don’t have the pattern…..this was a workshop that was a ‘show and tell, show and do’ kinda one! Perhaps I should try to convince the lady who shared it with me to write a pattern!!!!!! After all, it was super easy and pretty fast to put together….. about a day in total. I’m sure I’m going to have to make a few in different colours, and even a small one as a mug bag for guild meetings!!! Hope you’ve been getting some stitching done too….and remember to check in with me tomorrow for my giveaway in the blog hop party! Such a pretty bag, love it. Love your bag, Wendy. It's fun to be able to start and finish a project in roughly one sitting. Sweet bag. I can't wait for the giveaway surprise. Thanks for hosting. I've added your giveaway to my weekly link up. the color combo is my favorite:) thank you for participating in the giveaway! Your bag is absolutely beautiful.Love your fabrics combo! Bag is interesting and fabrics are lovely!!! Thanks for sharing! Your bag looks great but I don't see a post for the secret giveaway! Your bag is great! I would like to learn how to make that one. Your piping is superb. Your my stable bag is really very pretty. I'd love to know if the lady who shared it with you decides to write a pattern, I would love to get it as well! I've been busy sewing some shopping bags from some Christmas fabric. I'll use them to wrap presents then use them for shopping afterwards! Thanks for the chance to win!